Lee Hodges combines disparate objects — jewels, copper wire, recycled paper, cast-off plastics, and layers of iridescent paint — to form artwork that shimmers. The fusion of her passions for art and her faith into mixed media creations creates work that is inspiring both for its subject matter and the unique media she employs. Influenced by the sacred works of art of the Byzantine era and the Renaissance, by Klimt and Roualt, her mixed media pieces center on Biblical themes. Rather than setting out to deliver specific messages, the work evolves during the creation process becoming “visual meditations,” beckoning the careful observer to reflect on the concepts portrayed in her works. Lee, long active in the Ventura County arts community, served as director of the Buenaventura Art Association for 14 years before retiring to focus full-time on her art. She has received many awards, among them the Mayor’s Prize for Arts Leader in 2005. 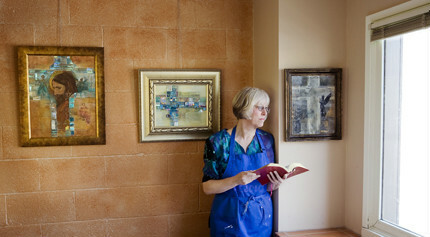 Various churches have commissioned her pieces, including Lovers Lane United Methodist Church in Dallas (Cross Series) and St. Paul’s Episcopal Church in Ventura. Lee Hodges’ documentation took place in 2008 and was sponsored by David & Patricia Herman. The FOTM Archive contains extensive information about this artist.